Justin DeRosier, a deputy with the Cowlitz County Sheriff's Office, was fatally shot while responding to a parking complaint on Saturday, April 13, 2019. 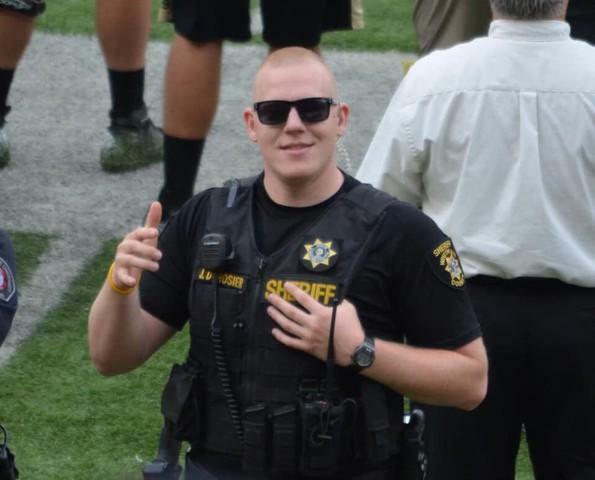 Authorities identified the Cowlitz County Sheriff's deputy who was fatally shot while responding to a parking incident on a rural roadway Saturday night as 29-year-old Justin DeRosier. Late Sunday night, the sheriff's department reported that officers had engaged near Spencer Creek Road in Kalama, Washington, with a person referred to as a suspect in the DeRosier shooting. That person died after shots were fired, and two others were jailed. A native of Kelso, Washington, DeRosier was a lifelong acquaintance of many members of the Cowlitz County Sheriff's office, Undersheriff Darren Ullmann said. "There are few cops that who want to be a cop more than Justin did," an emotional Cowlitz County Undersheriff Darren Ullmann told reporters during a press conference Sunday. "He loved his job. He was incredibly good at it. And as you can imagine, this is very personal for our agency." At a press conference Sunday afternoon, officials outlined what they know about Saturday's shooting. DeRosier was responding to a parking complaint about a motorhome on Fallert Road, a few miles northeast of Kalama, Washington, at around 9:30 p.m. Saturday. He was shot shortly after arriving on the scene at roughly 10:11 p.m., according to the sheriff's office. DeRosier was transported via LifeFlight to PeaceHealth Medical Center in Vancouver, Washington. He was pronounced dead early Sunday morning while undergoing surgery at the hospital. “It is devastating for all of us,” Cowlitz County Sheriff Brad Thurman told The Daily News Sunday. Thurman said DeRosier was the first officer killed in the line of duty in the office's 165-year history. "Our hearts go out to the family of the Cowlitz County deputy killed in the line of duty last night," Washington Gov. Jay Inslee said in a tweet Sunday. "Every one of these tragedies is a reminder that these men and women put their lives on the line every day in service to us all."